Hello Friends. It’s lovely to have you visit again! I always appreciate your visits and your comments. 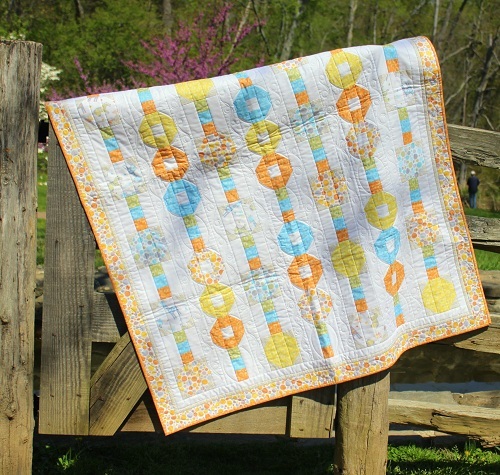 I am happy that I finally managed to have a photo shoot of one of my current quilts that is featured in the Summer 2014 issue of Fons & Porter’s Easy Quilts, Teething Rings. You remember your children’s teething days, don’t you? 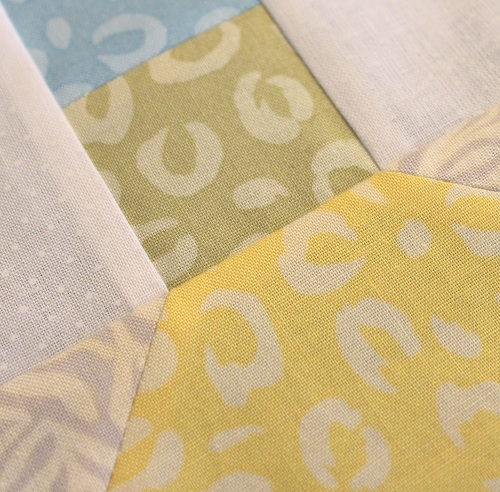 The quilt design features variations of snowball blocks that are easy to construct. I posted my trick to get the blocks pieced just right here. 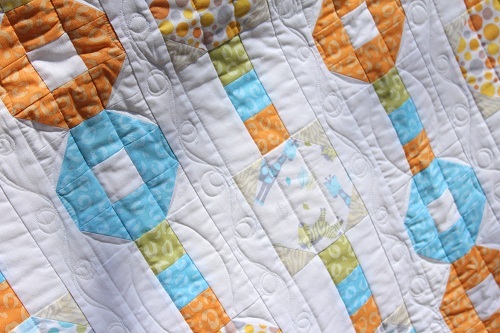 The quilt uses fabrics from Quilting Treasures’ Special Delivery collection. 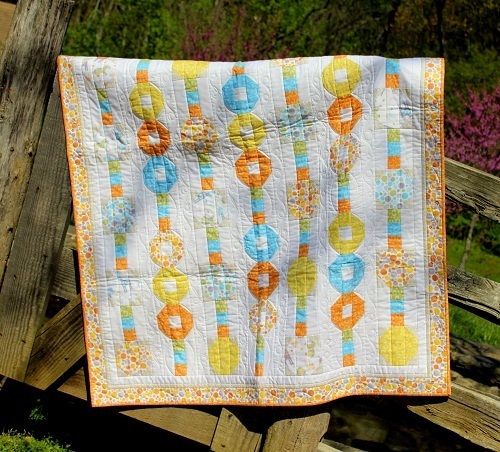 I love the blue and orange used together in the quilt. And the animal prints are just too adorable! Click here to view the fabric collection in its entirety. 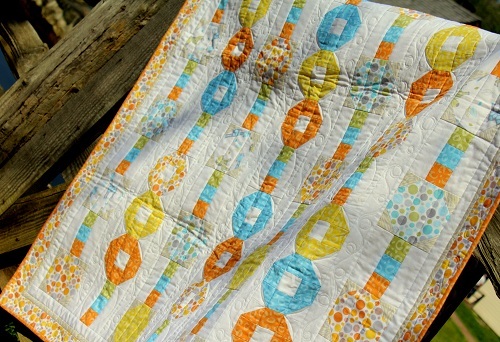 Informal free-motion quilting is done with Aurifil Mako 50 Cotton over Hobbs Tuscany Silk batting. 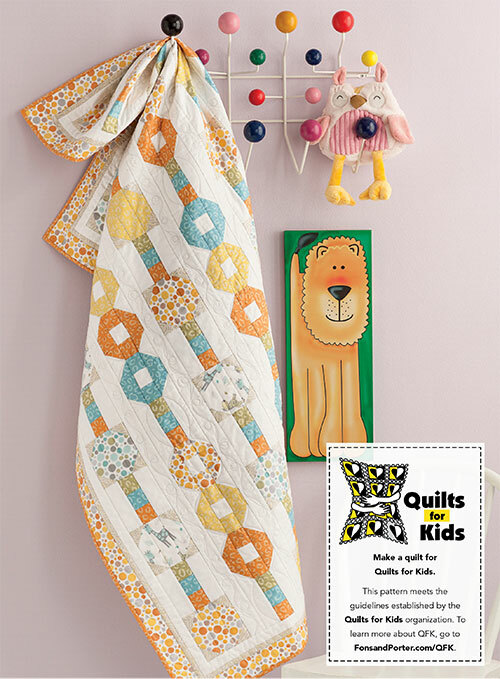 Teething Rings meets the requirements of Quilts for Kids quilts. Quilt kits are available for purchase here. Thanks so much for stopping by. I hope you have enjoyed Teething Rings. Yes, those teethings days were challenging for me, but they were nothing compared to the joy my little Miss Baby has brought to our family! Children are indeed a gift of the Lord (Psalm 127:3, NASB). 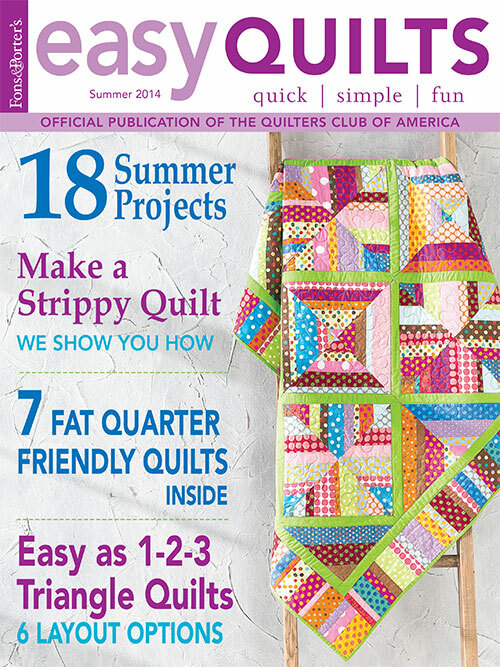 This entry was posted in Quilt kit, Quilt Pattern, Quilting, Quilts & Projects: Published, Quilts: Pieced and tagged Fons & Porter Easy Quilts Summer 2014, Quilting Treasures Special Delivery, Quilts for Kids, Wendy Sheppard Designs. Bookmark the permalink. So sweet! 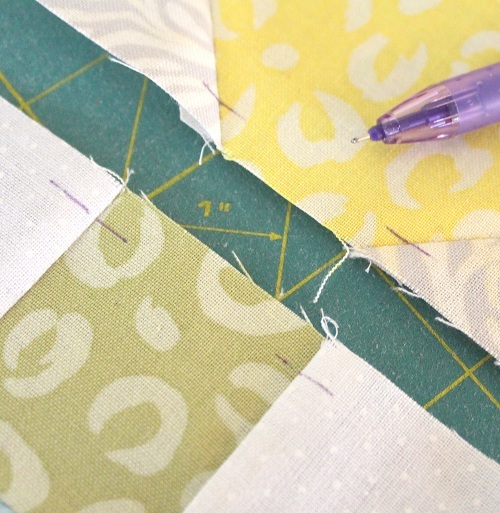 Great design and fabrics, and inspiring FMQ. Wendy, I love this quilt! I did indeed purchase this magazine last month while shopping with my mum heehee and saw your quilt in there. 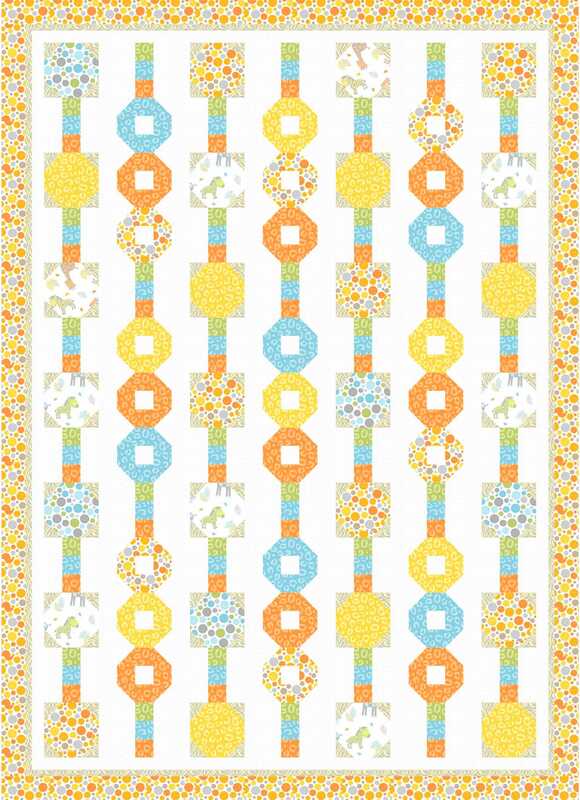 What a fun quilt~~Springy and fresh. Love your trick for matching. Very nice! Don’t know how you get as much done as you do! Amazing! I need to look for this magazine!! Once of the ladies in my quilting group does Quilts for Kids, it is heartwarming. This is such a beautiful quilt! 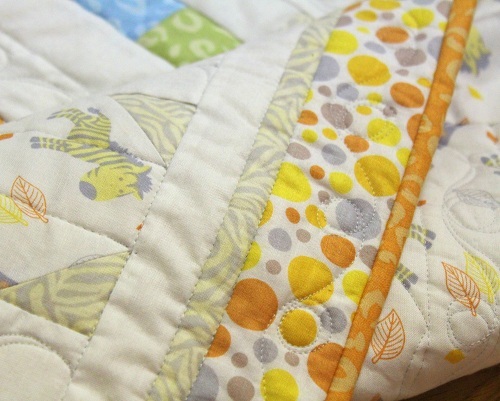 I love the colors, the pattern and of course your beautiful quilting!